One frame presented upon my return from Ethiopia hung on a wall for a long time. 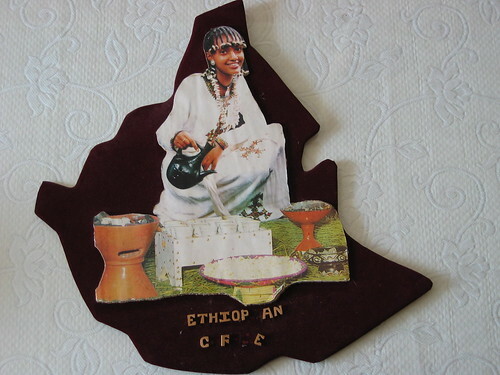 The frame was made from coarse materials showing Ethiopian lady performing coffee ceremony in front of incense pottery. Long time eroded it day by day; several characters attached on it fell down already. The color of photo has faded with the passing of time. The value priced in money is very low. 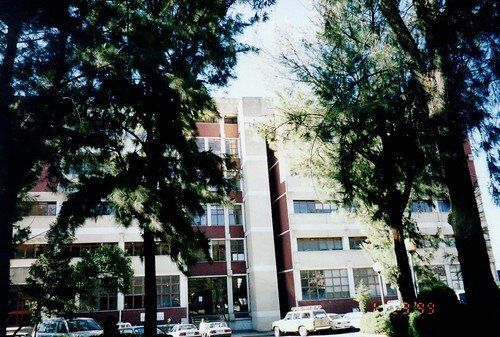 However, it's unmovable evidence that I had been to Ethiopia and I got invaluable experience from there. Today, I made up my mind to put it in a safe place to protect it from damage. I could realize that too many souvenirs took much space at home. They were from largely Japan, Ethiopia, USA, and other places I visited or friends did. Re-arranging them into appropriate slots took nearly all day. I could recollect beautiful memory linking a souvenir and whoever gave it to me. Fullest smile stayed with me all through the arrangement. What a virtue of travel and staying overseas! Aiming at a feasible approach for the conservation of natural forests in the Oromia Region of Ethiopia, dwellers there offer ecotourism program of hiking and horse riding exploring Bale Mountains. 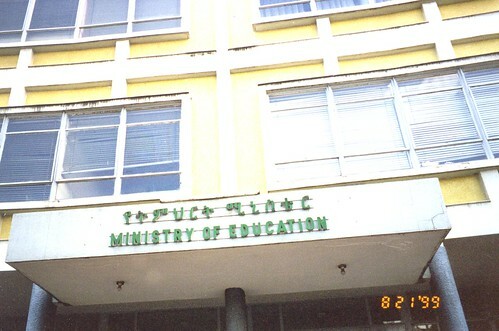 In the year of 2000, the second year of my stay in Ethiopia, I had been there with colleague Korea Overseas Volunteers (KOV). I never dreamed of such a great experience until the arrival there. My story from that place, thereafter, became one of big topics to speak about Ethiopia's nature. Korean usually complains the decrease of appetite from excessive sodium loss by sweat and after exhaustion of physical power in struggle against hot weather during summer season. Simple solution to revive appetite is to visit restaurants serving spicy and/or cool food. Enjoying home made recipe like "seaweed and vinegar over cold water" will be another way. 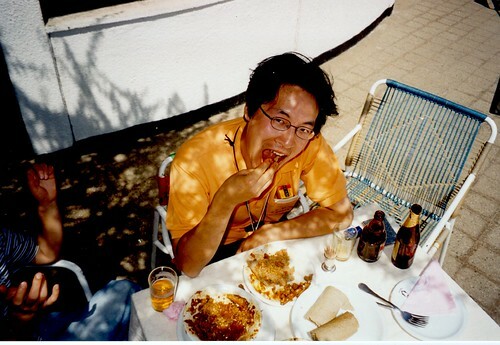 In search for memory how I sustained during dry season in Addis Ababa (not so hot as you imagine, though; refer to this link), I could enumerate what I usually chose for lunch and dinner to stimulate appetite. Then I revisited Ethiopian cuisine pages from Wikipedia and my bookmarks reminding me of real shape, color, odor, and taste. However, I can't prepare Ethiopian style dinner table at home now because several core ingredients are not available in Korea. We call this situation, "A pancake in a picture" :-) The photo below is to show you how much I enjoyed Ethiopian food. I had never been to Lake Tana, the origin and source of Blue Nile River during my stay in Ethiopia. This place has been thought of just as a lake for me till now. One article, titled "Egypt and the Hydro-Politics of the Blue Nile River" by Daniel Kendie surprised me by delineating SO SO complex issues born of historical, cultural, economical, political, religious background around the corner of the Horn of Africa. You can get a certain insight about what's going on there in connection with water resource. Cutting edge technology, blog system, now assists Awassa Children's Project! Called One Love Theater Blog shows what are going on in Awassa Youth Campus (AYC). I here put trackback on the first article of that blog to spread HIV/AIDS awareness with the help of blogging mechanism. Now, look it up from this link with my annotation! 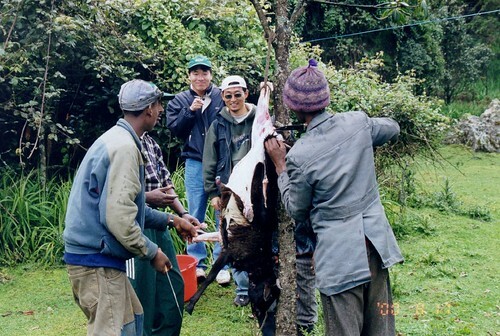 It was the first rural area visit upon my arrival in Addis (July 1999). 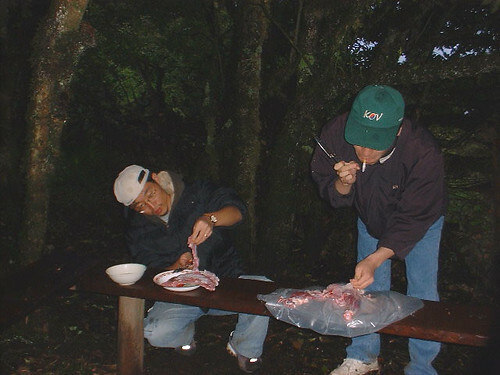 Experiencing wildlife and staying with local residents could be enough cultural shock on me. More understanding of people and way of their life kept me inside their society even in Addis Ababa. 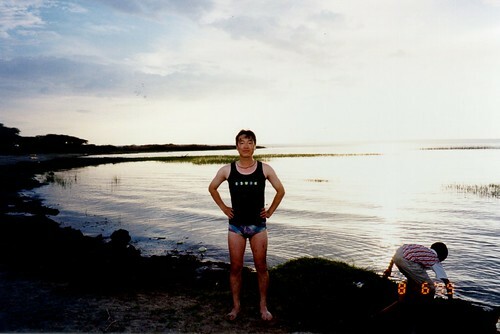 Though physical condition was unfavorable (I am afraid, still is), excursion to Langano lake became the central part of life long memory. I never dreamed Google in Amharic. 에티오피아어 구글이 있을 줄은 꿈에도 생각 못했음. Since the end of 2001, returning back to Korea from Ethiopia, no further information was available regarding the fight over what they faced. It is attributed, of course, to my indifference. Today, I could locate one of NGO operation sites in Ethiopia, called Awassa Children's Project. Here below, access URL is available. Movement by performance, another type of endeavor, we can experience indirectly from there. 에티오피아 문자와 실제 손으로 쓴 글씨 입니다. Alphabet of Ethiopian language (hereinafter, called Amharic) consist of numerous characters as shown in this link. As a part of KOV orientation training prior to departure to Ethiopia, I had a chance to learn Amharic from native speaker. Unlike the appearance of typical Amharic typeface above, my handwriting for simple Amharic sentences visualize practical use of Amharic characters. 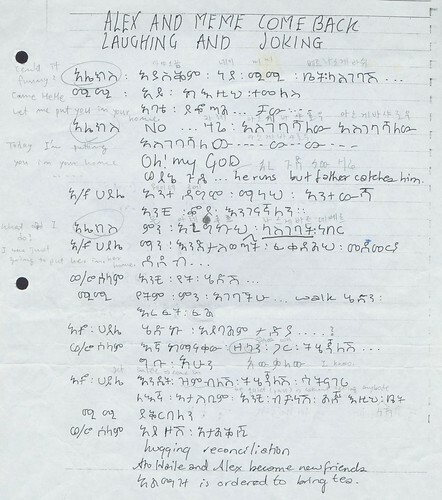 This is scanned copy of handwriting written by native Ethiopian. Tour guide for Ethiopia sometimes says the phrase, "Thirteen months of sunshine." The 13rd month is additional short-term month. Right after rainy season around September, Ethiopian new year starts with great celebration. Anyway, special calendar system implies Ethiopia's in-depth culture and historical prosperity. Ethiopia suffers overall difficulties in low economic condition, famine, and drought in lower land, however, on the other hand, has bright side in sophisticated culture, history, and potential natural resources. Therefore, tours to Ethiopia can be meaningful for whoever are interested in history routes (especially on Christian sites), diversified natural environment from low to high land (around 3,000m above sea level), and modernized capital city of Addis Ababa. 에티오피아를 소개하는 자료에 보면 "13개월의 햇살" 이라는 말이 가끔 나온다. 12개월 이후의 짧은 한달을 말하며, 일반력으로 볼 때 우기가 끝나는 시점인 9월에 해당된다. 낮은 경제 수준, 가뭄, 기근 등으로 인한 어려움은 에티오피아를 부정적으로 보여지게 하는 것이지만, 세련된 문화, 유구한 역사와 천연 자원은 에티오피아의 발전 가능성을 긍적적으로 보여주는 것이라고 할 수 있다. 에티오피아에 산재한 고대 기독교 유적, 저지대로부터 고지대(해발 3,000미터 이상)로 이어지는 다양한 자연 환경, 현대화된 수도 "아디스 아바바" 등은 에티오피아 여행에 관심 있는 이에게 의미 있는 것들이 될 수 있다. 아래 사진은 본인 또는 동료 봉사단원이 에티오피아 체류중에 찍었거나 잡지로부터 얻어낸 사진들이다. 1. 베르디의 오페라 [아이다]의 배경은 이집트와 에티오피아이다. 두 나라 남녀의 사랑 이야기가 오페라의 줄거리이다. 여자 주인공은 에티오피아 공주! 3. 하루에 수도 없이 마시는 커피의 원산지 이다. (거의 정설임) 인터넷 검색 창에서 [커피의 원산지] 라는 검색어 넣으면 관련 자료 많이 나온다. 에티오피아는 굶주림과 가난으로 알려져 있는 국가이지만, 다른 아프리카 국가에 비해 역사, 문화적으로 앞선 나라이다. 경제 잠재력 측면에서도 발전 가능성을 가지고 있다. 대중 매체를 통해 알려진 것은 부정적인 것이 많으나 에티오피아 발전의 원동력이 될만한 사실들이 의외로 많다. 우선, 3000년 이상 되는 역사를 바탕으로 한 성숙된 문화를 들 수 있다. 에티오피아는 아프리카에서 유일하게 고유 문자 체계(Amharic)를 가지고 있어 이에 기반한 고유 문화가 발달되어 있다. 예수 출현 시기 전/후부터 발전시켜온 기독교 역시 고유 문자 체계의 사용과 밀접한 관계가 있다. 에티오피아 전역에는 오랜 역사를 말해주는 유적, 유물들이 도처에 산재해 있어 관광 자원이 풍부하다고 할 수 있다. 수자원은 에티오피아의 다른 면을 반영하는 것 중 하나다. 블루 나일의 수원지인 따나 호수는 북동부 아프리카의 수원이 되고 있다. 국토 내에 존재하는 많은 호수는 농업 및 관광 자원으로서의 가치가 높다. 대외 관계에 있어, 에티오피아는 "아프리카 외교의 중심지 (Diplomatic Central of Africa)" 라는 별명을 가지고 있다. 아프리카 지역의 경제 발전을 위한 UN 기구인 아프리카 경제 위원회 (ECA; Economic Commission for Africa)와 아프리카연합(African Union)의 본부가 모두 에티오피아에 위치하고 있다. 지정학적인 면에서도 에티오피아는 유럽, 중동, 아프리카를 잇는 중심지에 위치하고 있기 때문에 아프리카와 다른 대륙과의 교류에 있어 중추적인 역할을 하게 될 것이라 예상되고 있다.